The myth of Narcissus comes in two different versions, the Greek and the Greco-Roman version, as both Conon the Greek and Ovid, the Roman poet, wrote the story of Narcissus, enhancing it with different elements. The myth presented by Ovid the poet is slightly altered. According to this myth, Narcissus’ parents were worried because of the extraordinary beauty of the child and asked prophet Teiresias what to do, regarding their son’s future. Teiresias told them that the boy would grow old only if “he didn’t get to know himself”. When Narcissus was sixteen he was walking in the woods and Nymph Echo saw him and felt madly in love with him. She started following him and Narcissus asked “who’s there”, feeling someone after him. Echo responded “who’s there” and that went on for some time until Echo decided to show herself. She tried to embrace the boy who stepped away from Echo, telling her to leave him alone. Echo was left heartbroken and spent the rest of her life in glens; until nothing but an echo sound remained of her. Nemesis, though, the Goddess of Revenge, heard the story and decided to punish Narcissus. From this point the stories are similar; Narcissus sees himself in the pond and he is amazed by the beauty of the reflection. Once he figured out that his love could not be addressed, he killed himself. The myth of Narcissus is known also for one additional reason; the flower Narcissus that is found usually at the banks of rivers and lakes, took its name after the mythical hero. It is a graceful flower featuring 40 different species, mostly grown in Europe. It blooms in early spring and is considered fragile and very beautiful, with white, yellow and pink blossoms. 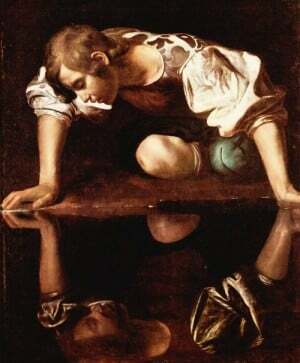 The Myth of Narcissus has inspired several artists as well; the most known is Caravaggio who painted a young man admiring his reflection in the water. The painters Turner and Dali were also inspired by the myth, while poets, such as Keats and Housman, used his example in many of their works. The Russian writer Fyodor Dostoevsky created several characters with the mentality and loneliness of Narcissus, such as Yakov Petrovich Golyadkin. It’s very enjoyable!!!!!!!!!!! Narcissus is beautiful Like Brad Pitt! Its an exceptional myth ! Narcissus is a good guy ! ah ah ! I think this myth is often misinterpreted. I’ve just been reading an interpretation of this myth that’s less obvious and far more interesting than the main stream interpretation of Narcissus. I understand narcissism to be a stage that we all (should) go through as young adults or adults. We are all a little self obsessed as children and teenagers, thinking the world revolves us or that we’re always right. This doesn’t mean we’re ‘in love with ourselves’ – it could almost be the opposite: that we’re not sure about ourselves and therefore trying to push ourselves as individuals: our ideas and establish ourselves. Hopefully, in time, our love for ourselves will develop and we will be able to have faith in ourselves and be comfortable with who we are. For some people this stage might not come (for whatever reason) and they never get past the ‘self obsessed’ stage. This is sad but not necessarily bad. If we can allow ourselves to be true to ourselves, we can settle, find our way in life and become more at ease who we are; love ourselves and who we truly are. This is when we go to the next stage, and I understand that Narcissus, moved to this next stage: he blossomed into a flower, the narcissus… maybe by looking in at who he was he was just able to be true to his soul, true to who he was and love himself. Nicely put. Thank you for sharing your thoughts, would you also mind sharing where you read the interpretation mentioned? I was thinking how the “looking at his own reflection” aspect of this mythology ties in to the current phenomenom of “Selfies”, and the latest term that I just hearh on the radio, “selfi–itist” , describing those who are obsessed with taking tons of their own pictures daily. When this behavior overwhelms family members that spells trouble for the person consumed by narcissism. The person sees absolutely nothing wrong in his world perception, and considers all other humans have collective flaws which blind them to his enormous ‘talents.’ I am unaware of anyone with this trait, who has redeemed himself and found salvation. Perhaps there are, perhaps you are aware of one? . Narcissus is a very alarming tale. There are so many versions in it, but all end in him either wasting away, drowning, or committing suicide. Can people really be THAT narcissistic? I always thought narcissists were just more self- centered, nothing dangerous. I wonder, do narcissists know they’re narcissistic? Do they think everyone thinks like them? Or is it more like ADHD where you know there’s a problem? I feel bad for Narcissus and those who suffer his ailment. What it must be like to live day to day in a warped reality.